If you host a party and a guest accidentally knocks over a candle that starts a fire or otherwise damages your home, it’s likely that your homeowner’s insurance policy will cover the damage. 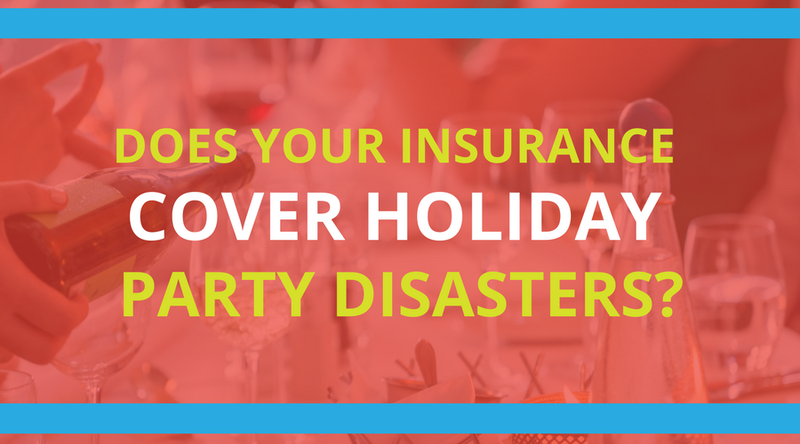 However, if you are planning on serving alcohol at your holiday party, you may want to review your policy. Many homeowner’s policies specifically exclude coverage for damages related to drugs and alcohol. If that’s the case for your policy, you may wind up footing the bill for home repairs. If you are going to be serving alcohol at the party, you may need additional coverage, either as an add-on to your general liability insurance or in the form of special event insurance that specifically covers alcohol related issues. This may also include coverage for the cost of the party if it has to be canceled due to weather or other circumstances out of your control. You’ll also want to remind your employees that even if the event is taking place at an offsite location, company policies and decorum still apply. Insurance may cover alcohol and sexual harassment claims from an out-of-control company party, but it would be better to avoid those issues in the first place by establishing acceptable behavior. If you have any concerns about whether or not you’re covered for holiday issues, give us a call and we’ll review your policy to make sure you have everything you need. SEE ALSO: What Happens When You Get Hit By An Uninsured Motorist?